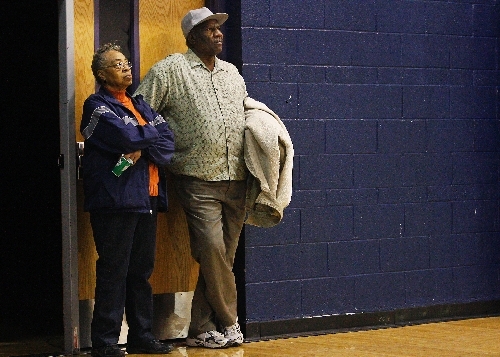 It was halftime at a recent Canyon Springs High School basketball game, and though the Pioneers were getting drubbed by Valley, Freddie Banks, whose jersey hangs in the Valley trophy case but who now coaches at Canyon Springs, nodded yes to a couple of newspaper guys. It was OK to go inside the Pioneers’ locker room. Eldridge Hudson, one of Banks’ assistants, was giving the Canyon Springs players a Sgt. Hulka-in-“Stripes” earful. Then it was Banks’ turn. He had spent the first two quarters exhorting the Pioneers to “Find your man! Find your man!” and to “Get back! Get back! Get back!” on defense. The Pioneers weren’t finding their man or getting back on defense nearly enough. They trailed by 14. Banks spoke in a moderate but passionate voice as the Pioneers lowered their chins and shuffled their feet. As Banks and his assistants huddled near the showers, the murmur of young voices was heard behind a closed door. The young voices said they would find their man and get back on defense. The Pioneers played better in the second half. Twice they whittled the Valley lead to five points before missing free throws. Freddie Banks is learning it is more difficult to correct things as a coach in high school than it was as a player in college. Remember the 1987 regional final? UNLV trailed Iowa by 18 before Banks and Armen Gilliam and Mark Wade and Hudson, who came off the bench to snare six rebounds, fixed it. Then the Rebels nearly fixed Bob Knight and Steve Alford and Keith Smart in the Final Four. Banks scored 38 points and made an NCAA-record 10 3-point shots. Gilliam scored 36. Wade had 18 assists. It wasn’t enough. But that was nearly 25 years ago. When Freddie Banks was making it rain from 3-point distance in New Orleans, it would be another 10 years before some of the Pioneers even were born. 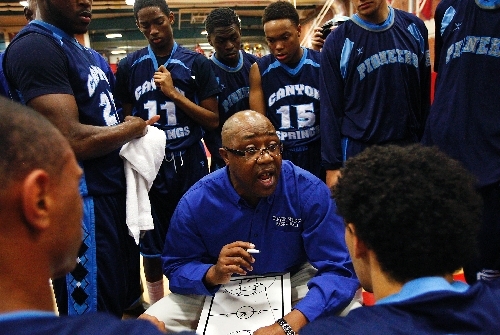 Banks is in his first year as Canyon Springs coach. The Pioneers won last year’s 4A state championship, mostly because they were better and older than this year. And mostly because Bishop Gorman, which is pretty good at the dribbling and fancy stuff, grew disinterested while playing Bishop Manogue from Reno and inexplicably lost in the semifinals. Daryl Branham resigned as Pioneers coach, leaving Banks to mold these young Pioneers into something special, which they almost certainly will become. Probably not this year, though. 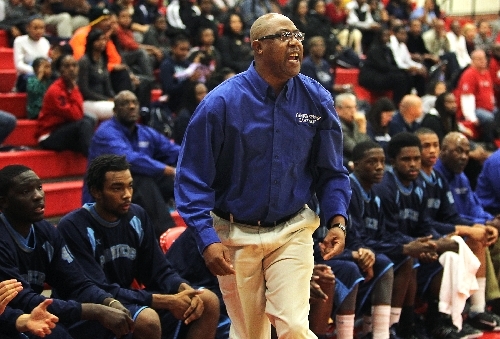 Canyon Springs is 11-8 overall and 5-2 in the Northeast Division, but continues to miss free throws. Freddie and Brenda Banks know about big, happy families. They were two of six children born to Tilmon and Martha Banks of Lake Providence, La., a town that traces its roots to 1862 as a supply camp for General Ulysses S. Grant and the Union Army during the Vicksburg campaign. Tilmon Banks was general of the Banks household. When Freddie or one of his siblings would mess up, they would bring their papa a switch. You could do that as a parent in those days. Freddie said he was a humble kid who didn’t mess up much. His mom and dad have been married 57 years. Tilmon Banks was a bellman at the old Hacienda. Martha Banks was a housekeeper and then a housekeeper inspector at the old Union Plaza downtown. They put five kids through college; it would have been six, but Freddie’s sister Karen, a secretary at Canyon Springs, wasn’t interested in a secondary education. “None of my kids have ever been arrested, never been expelled from school,” Martha Banks said. Back in Lake Providence in East Carroll Parish, that’s saying something. That’s saying something just about anywhere these days. Freddie Banks and his wife, Nieda, have raised seven kids of their own — Wesley, Freddie Jr., Brandon, Darington, Sidney, Vashonda and Courtney. Freddie Jr. is playing pro ball in the latest incarnation of the ABA. Sidney, his oldest, is 30. Yes, time flies, and in the manner of a peregrine falcon. Somehow, “Fearless Freddie” Banks, the fourth-leading scorer in UNLV history; who put 38 points on Bob Knight and Indiana; who plans to coach Canyon Springs to its second state championship in the near future unless he’s coaching at Harvard, of all places; who puts family values and the value of a secondary education ahead of finding one’s man and getting back on defense and even sinking free throws; has turned 47 and has six grandchildren. Las Vegas Review-Journal columnist Ron Kantowski can be reached at rkantowski.com or 702-383-0352. Follow him on Twitter: @ronkantowski.